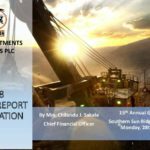 At the Annual General Meeting held on 28 January 2019 at Southern Sun Hotel, Lusaka, the Shareholders approved a Final Dividend of K 0.61 per share for the period ended 31 March 2018. In accordance with the requirements of the Securities Act No. 41 of 2016 and the Listings Rules of the Lusaka Securities Exchange (“LuSE”), Notice is hereby given that the dividend shall be payable to shareholders in the Company’s books as at close of business on Friday, 22 February 2019 (“Record Date”). Dividend payments will be effected from Monday, 25 February 2019 for shareholders whose shares are listed on the LuSE. Shareholders are advised to take note of the following dates applicable to the Stock Exchange on which their shares are listed and traded. The transfer books and register will be closed on Friday, 22 February 2019. Dividend payments will be effected from Friday, 15 March 2019. The transfer books and register will be closed from Thursday, 21 February to Friday, 22 February 2019 both days inclusive. Dividend payments will be effected from Monday, 25 February 2019.